When I ordered my Ancestry autosomal kit, called AncestryDNA, I said that I’d blog my way through the process so you can join me. The kit arrived in about ten days, and then it laid on my desk for the next two weeks, looking at me accusingly every single day, silently nagging me. Today, I capitulated, like I had been meaning to do every single day for the past two weeks. I opened the kit and followed the instructions to register the kit. Easy enough. Enter the bar code on the vial. That bar code connected the kit with my account at Ancestry, and after I entered the code, I saw this next form as part of the activation process. I clicked on gender and then I clicked in both the Consent Agreement and the Terms and Conditions boxes. I was just about to click on the “Activate this test” button when that little voice started to speak to me. Now long ago, I used to ignore that little voice, much to my own detriment. When I was younger, it used to say things to me like “you should do what your mother said.” I hated it. When I was in college, it used to say things like “you really should go home and study statistics rather than have another beer.” I REALLY hated it then. I won’t even tell you what it said when I got engaged the first time. You get the idea. But that little voice said to me, “Hmmm, that’s odd. Why two things to click?” And having always suffered when I ignore the little voice, I’ve finally learned to pay attention, for the most part. So I went and clicked on both the “Consent Agreement” and the “Terms and Conditions” links, and was I ever glad that I did. The words “Consent Agreement” look so benign, especially after working with Family Tree DNA’s consent agreement which is about 2 sentences and very straightforward. This one is anything but, AND, I was mortified to see what I was consenting to, other than what I expected, which was to process my kit for genealogy purposes. Let me say right here and now that you do NOT have to agree to the Consent Agreement to activate your kit, although it doesn’t say that on this page. And given where this box is placed, it certainly gives the impression that you need to click both these boxes to activate the kit, but you don’t. The word “optional” doesn’t appear. There is also nothing to alert you, on this page, that what you are consenting to is research, not simply consenting for your test to be run. Whoda thought??? I did not agree to the Consent Agreement. I did agree to the Terms and Conditions, which are required, and my kit was activated. I’m betting most people don’t even read this verbiage, and I’m betting Ancestry is counting on that fact. In this techno-world, people have come to expect that you have to “click” to agree to whatever, so they click because they feel they have no other option if they want the product…in this case…to activate the kit which they have aleady purchased. While this is the case for the Terms and Conditions, it’s not for the Consent Agreement, which should really be termed optional. Ancestry will be using, and potentially SELLING your DNA results, including MEDICAL and genealogical information. In the Terms and Conditions, which is required to activate your kit, you are granting them a TRANSFERRABLE LICENSE to any information you put into ancestry, plus your DNA results. See items 4 and 7 in the Terms and Conditions section, below. When I gave consent at 23andMe, I signed something very similar to this. But 23andMe is a company that specializes in health traits and risks. I EXPECT them to be doing research. In fact, they are very up-front about the fact that they are doing this. I WANT them to make advancements in science based on crowd-sourcing. But Ancestry.com is not 23andMe. Their primary purpose in life is not medical testing or health traits. It’s genealogy and family history. I ordered this test to discover more about my family history, to be matched against others who also took the test, not to make my DNA available outside of that realm. I had to agree to the Terms and Conditions, so whether I want my DNA and genealogy records to be transferrable to whomever, wherever, whenever, or not, they will be. That is apparently the price of admission to genealogy testing, at least autosomal testing, at Ancestry.com. When I saw that Ancestry gave away thousands of kits initially, followed by selling several thousand more at $99, I wondered how it was that they could afford to do that when the same test, in essence, was being sold by Family Tree DNA for $289 and by 23andMe for $299. Maybe the verbiage that includes medical information tied to genealogy information and the requirement to give up rights to your information in order to test is part of the reason that they can afford to sell this test for $99. Hmmmm…. Maybe that little voice that was saying to me, “if it sounds too good to be true, it probably is,” is right. Of course, the next step in the kit activation process are prompts to begin your genealogy tree or to upload your GEDCOM file. If you’re going to take the autosomal test, Ancestry’s matching would be very ineffective without the tester providing genealogy information about themselves. I did enter a few generations, as I wasn’t about to upload my entire GEDCOM file, but I also realize that I’ve forever released the information I entered, including the names of my parents and my birth year, into the great transferrable abyss. The little voice is not happy with me. I’m just not convinced that this is ultimately in my best interest. Below, Ancestry’s Information and Consent Form as well as their Terms and Conditions are copied directly from their webpage. All verbiage, links, highlighting, etc., from here down, is entirely theirs. We would like you to be part of a research project. This Consent Form gives you information to help you decide if you would like to participate in the research project to be performed by Ancestry.com DNA, LLC (“AncestryDNA,” “us” or “we”). We believe in being transparent so you can understand this consent form and what we are attempting to accomplish through the research project described below. If you have any questions, please contact us using the information below and feel free to discuss your participation with anyone you choose in order to better understand this research project and your options. Anyone who is using the AncestryDNA service to find out about their genetic ancestry may also voluntarily participate in this research project. You do not have to be in this research project if you don’t want to. If you are the parent or guardian of a minor who may wish to participate in this research project, you should talk with your child and go over the information in this form with him/her before you and your child make a decision about whether to participate. Your child does not have to participate if he/she does not want to. Please read this Consent Form carefully; you should print out a copy and keep it somewhere safe. A copy of it is also always available on our website. 1. What is the research project? The AncestryDNA’s Human Genetic Diversity Project (“The Project”) will collect, preserve and analyze genetic information, genealogical pedigrees, historical records, surveys, medical and health records and other information (collectively, “Information”) from people all around the world in order to better understand human evolution and migration, population genetics, ethnographic diversity and boundaries, genealogy, and the history of our species. Researchers hope that the Project will be an invaluable genealogic tool for future generations and will engage the interest of a wide range of scholars interested in genealogy, anthropology, evolution, languages, cultures, medicine, and other topics. The Information will not be used for medical purposes in the treatment or diagnosis of any individuals. How do I take part in the research? What are the costs and will I receive compensation? Could my participation end without my consent? How do I withdraw from the Project? 2. What information will be collected? The Project will collect genetic, genealogical and health information that has been stripped of any personally identifiable information in order to study the history of our species. Genes are in your cells, and they are what make you different from anyone else. Some genes control things like the color of your hair or eyes. Genetic information includes your genotype that is discovered when AncestryDNA processes your saliva or is otherwise provided by you to AncestryDNA (the “Genetic Information”) when you choose to use the AncestryDNA service. Genealogical information is your pedigree, ethnicity, family history, and other information about you that is either provided by you or is gleaned from publicly available documents on Ancestry.com’s website and other locations (the “Genealogical Information”). Health information includes self-reported information from you such as medical conditions, diseases, other health-related information, personal traits, and other information that is either provided by you or is gleaned from publicly available sources, documents on Ancestry.com’s website and other resources (the “Health Information”). In all cases for this Project, personally identifiable information about specific study participants (such as name and birth date) is removed from the Information before it is compiled as part of this Project. The Project will take all of this information (that is already stripped of personally identifiable information) and compile it into a single data summary to minimize the possibility that any individual participant can be identified by any researcher or other individual from the Information. Your Information will be combined with others and used to further the Project’s objectives of increasing our understanding of the components that define the history of our species. Discoveries made as a result of this research could be used in the study of genealogy, anthropology, evolution, languages, cultures, medicine, and other topics. In any publication of the studies or results, the genetic, genealogical and health information will be stripped of any personally identifiable information. 4. How do I take part in the Project? To participate, you need to follow the instructions on our website to submit a Test Kit (i.e., a cheek swab sample). Study staff may contact you to ask you to complete a questionnaire or to ask you if you are willing to be interviewed. 5. What are the costs and will I receive compensation? The costs of participating in the Project and having your DNA analyzed are the same as having your DNA analyzed on Ancestry.com and not participating in the Project. You will not be charged for participating in the Project. You will not get paid for being in this Project. The sample(s) you provide for this genetics Project might benefit AncestryDNA in the future. AncestryDNA will own the results of the research and any subsequent publication of the results. You will remain the owner of the samples you provide. Your samples will be stored until AncestryDNA destroys them. 6. What are the benefits of participating? Participating in this Project may not benefit you directly. But your participation in this Project will assist scientists to better understand our species, including our shared anthropology and medical and genetic traits. Your individual DNA results will be communicated to you regardless of whether or not you consent to be in this Project, including information about genetic relatives, geographic origin, and ethnicity. 7. Are there any risks to participating? 8. How will you protect my information? Be aware that your study records (which include your genetic and other information as described above) will be shared and copied as needed for the Project. 9. Could my participation end without my consent? AncestryDNA has the ability to terminate the Project in its discretion without your consent. AncestryDNA will protect your Information even after the study is terminated. 10. How do I withdraw from this Project? Participation in this study is purely voluntary. You can decide not to be in this Project and, at any time, you may choose to withdraw some or all of the Information provided by sending a request to consent@ancestry.com. There will be no penalty to you, and you won’t lose any benefits. AncestryDNA will cease using your Information for the Project as soon as it reasonably can after receipt of your request. Any research using your Information that has been performed or published prior to this date will not be reversed, undone, or withdrawn. If you choose not to participate in the Project, you will still receive your genetic information (i.e., genetic relationships/matching and ethnicity). 11. Further Information and FAQs. If you have questions about what it means to be in a research study, you can call Quorum Review (a research ethics board that reviews this study) at 888-776-9115 begin_of_the_skype_highlighting 888-776-9115 end_of_the_skype_highlighting, or visit the Quorum Review website at www.quorumreview.com. These Terms and Conditions apply to users visiting or registering on or after May 3, 2012. For existing Users (as defined below), these Terms and Conditions will be come effective on June 3, 2012. For the previous version of the Terms and Conditions, please click here. Please note that hyperlinks embedded in these terms and conditions (this “Agreement”) may only be accessed through our website. If you are reviewing this Agreement through mobile devices, you may need to visit the website to use the hyperlinks. Before using this website, ordering a DNA testing kit or having access to the results of the DNA testing, you must review and accept this Agreement which defines your rights and responsibilities as a user of the website and DNA testing service (“User”) operated by Ancestry.com DNA, LLC (“AncestryDNA” or “we”) and located at AncestryDNA.com or via the section of Ancestry.com’s website located at dna.ancestry.com (the “AncestryDNA Website”). The AncestryDNA Website is operated and services are provided in the United States of America. DNA testing and access to the AncestryDNA Website are governed by this Agreement, which, in turn, is governed by the laws of the State of Utah and the United States. Registering as a User and having DNA tested as a part of this service results in your personal and genetic information being stored and processed in the United States, and you specifically consent to AncestryDNA’s storage and processing the DNA and other personal data you submit. The AncestryDNA Website and services provided herein are intended for adults. If any minor gains access to the AncestryDNA Website, the parent or guardian of that minor will be held strictly responsible for that minor’s actions. If you submit a DNA sample of a minor, you must represent that you are the minor’s parent, legal guardian and/or have explicit permission from the minor’s parent or legal guardian. If you do not agree with any provision of this Agreement, or if you have any objections to the AncestryDNA Privacy Statement, you must not use the AncestryDNA Website or be a User. AncestryDNA is part of the Ancestry family of websites, which includes, among others, ancestry.com, rootsweb.com, and familytreemaker.com, as well as international websites such as ancestry.co.uk, ancestry.de, ancestry.fr, ancestry.it, ancestry.se. AncestryDNA offers both a DNA test to help discover your ancestors and an online service where Users view the results of their DNA test (together the “Service”). The AncestryDNA Service can be used in conjunction with the Ancestry family of websites to enable Users to discover, research, and save family history by searching extensive databases of records on www.ancestry.com’s website (or through certain other websites in the Ancestry family of websites) and by utilizing Ancestry.com’s family tree services. AncestryDNA Users and users of the Ancestry family of websites may also communicate with each other in order to collaborate and exchange family history related information (the “Ancestry.com Community”). The AncestryDNA Website contains graphics, information, data, user generated information, editorial and other content accessible by users (the “Content”). All Content is owned, licensed to and/or copyrighted by AncestryDNA and may be used only in accordance with this limited use license. The AncestryDNA Website is protected by copyright as a collective work and/or compilation, pursuant to U.S. copyright laws, international conventions, and other copyright laws. You may use the Service, access the Ancestry Website, use the graphics, information, data, editorial and other Content only for personal or professional family history research. Republication or resale of any of the Content or other protected data is prohibited. You may use the software provided on the AncestryDNA Website only while online and may not download, copy, reuse or distribute that software, except where it is clearly stated that such software is made available for offline use. AncestryDNA and its licensors retain title, ownership and all other rights and interests in and to all information and Content on the AncestryDNA Website. Bots, crawlers, spiders, data miners, scraping and any other automatic access tool are expressly prohibited. Violation of this limited use license may result in immediate termination of your membership and may result in legal action against you. D. You must not use the information from the AncestryDNA website or DNA tests in whole or in part for any discrimatory or otherwise illegal activity (for example, to make insurance or employment decisions). Cancellations and Refunds Cancellations may be made by calling AncestryDNA at 1-800-958-9124 begin_of_the_skype_highlighting 1-800-958-9124 end_of_the_skype_highlighting and providing the same information that you provided when you ordered your AncestryDNA Service. If you cancel within the first 30 days of placing your order, and before you returned a DNA sample to AncestryDNA, you will receive a refund equal to the price paid for the AncestryDNA Service minus $25. If you cancel within the first 30 days of placing your order but after you have returned a DNA sample to AncestryDNA, you will receive a partial refund equal to one half of the price paid for the AncestryDNA Service. AncestryDNA does not refund shipping & processing charges or any applicable taxes paid. Your credit will be provided via the credit card you used to purchase the AncestryDNA Service. Please allow a reasonable time for the credit to reach you. Replacement Testing Kits Should you require a replacement DNA testing kit, you may call AncestryDNA at 1-800-958-9124 begin_of_the_skype_highlighting 1-800-958-9124 end_of_the_skype_highlighting and providing the same information that you provided when you ordered your AncestryDNA test. Replacement kits are $25 per kit (plus applicable shipping and handling). Portions of the AncestryDNA Website allow you and other Users to contribute material to be displayed on the AncestryDNA Website (“User Provided Content”). For User Provided Content, AncestryDNA is merely hosting and providing access. We cannot, and expressly do not, accept any liability with regard to such User Provided Content (including with respect to its accuracy). While we cannot preview or monitor User Provided Content, we may apply, at our discretion, automated filtering tools to monitor and/or delete any content that AncestryDNA believes to be in violation of this Agreement. We reserve the right to act expeditiously to remove or disable access to any User Provided Content that we believe violates this Agreement. We are also sensitive to the copyright and other intellectual property rights of others. For complaints regarding copyright infringement, illegal or inappropriate content, click here. Any sweepstakes, contests, raffles or other promotions (collectively, “Promotions”) made available by AncestryDNA may be governed by rules that are separate from this Agreement. If you participate in any Promotions, please review the applicable rules as well as our Privacy Statement. If the rules for a Promotion conflict with this Agreement, the Promotion rules will apply to those specifically conflicting sections only. No Warranty. We make no express warranties or representations as to the quality and accuracy of the Content, AncestryDNA Website or Service, and we disclaim any implied warranties or representation to the maximum amount permissible under applicable law. We offer the DNA testing and AncestryDNA Website on an “as is basis” and do not accept responsibility for any use of or reliance on the AncestryDNA Website, Content or Service, or for any disruptions to or delay in the AncestryDNA Website, Content or Service. In addition, we do not make any representations as to the accuracy, comprehensiveness, completeness, quality, currency, error-free nature, compatibility, security or fitness for purpose of the AncestryDNA Website, Content or Service. AncestryDNA does not guarantee the adequacy of the Service or AncestryDNA Website or compatibility thereof to your computer equipment and environment and does not warrant that this AncestryDNA Website, the Content, the Service, its servers, or any emails which may be sent from AncestryDNA are free of viruses or any other harmful components. AncestryDNA does not control or endorse any actions resulting from your use of the AncestryDNA Website, Content or Service and specifically disclaims any liability regarding any actions that may result from your use of the Service or AncestryDNA Website. If a dispute arises between you and AncestryDNA, our goal is to provide you a neutral and cost effective means of resolving the dispute quickly. To that end, you agree to first contact AncestryDNA Customer Support at 1-800-958-9124 begin_of_the_skype_highlighting 1-800-958-9124 end_of_the_skype_highlighting to describe the problem and seek a resolution. If that does not resolve the issue, then you and AncestryDNA agree to the following methods to resolve any dispute or claim between us. First, you agree that this Agreement is governed by the laws of the State of Utah, without regard to its principles on conflicts of laws, and the federal law of the United States of America. Second, you agree that you will seek arbitration consistent with the rules set forth below before initiating any litigation. If arbitration cannot resolve the issue, you agree to submit to the personal jurisdiction of the courts located within Utah County, Utah for the purpose of litigating all such claims or disputes. Any arbitration will be governed by the Commercial Dispute Resolution Procedures and the Supplementary Procedures for Consumer Related Disputes of the American Arbitration Association (collectively, “AAA Rules”). The AAA Rules and costs are available online at www.adr.org or by calling the AAA at 1-800-778-7879 begin_of_the_skype_highlighting 1-800-778-7879 end_of_the_skype_highlighting. YOU AND ANCESTRYDNA AGREE THAT EACH MAY BRING CLAIMS AGAINST THE OTHER ONLY IN YOUR OR ITS INDIVIDUAL CAPACITY, AND NOT AS A PLAINTIFF OR CLASS MEMBER IN ANY PURPORTED CLASS OR REPRESENTATIVE PROCEEDING. Further, unless both you and AncestryDNA agree otherwise the arbitrator may not consolidate more than one person’s claims, and may not otherwise preside over any form of a representative or class proceeding. Notwithstanding the foregoing, this arbitration agreement does not preclude you from bringing issues to the attention of federal, state, or local agencies. Such agencies can, if the law allows, seek relief against us on your behalf. This arbitration provision shall survive termination of this Agreement. 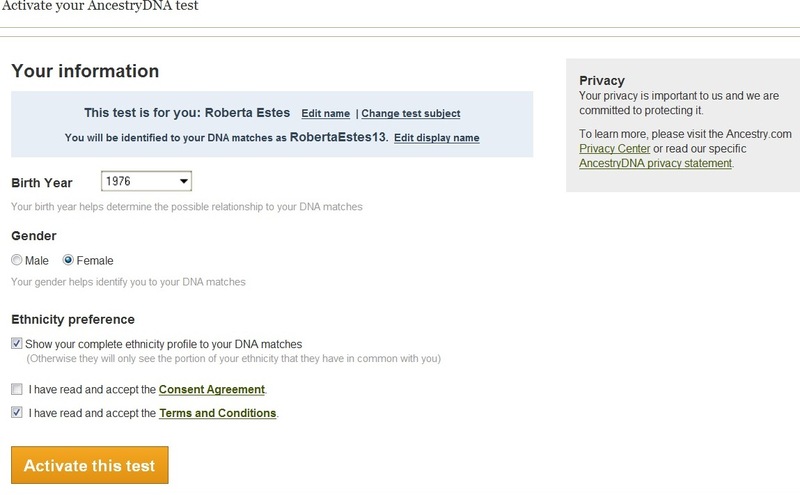 This entry was posted in Autosomal, DNA Testing Companies, Legalities and tagged General Information by Roberta Estes. Bookmark the permalink. Thanks for this very informative article!! It just backs up my distaste for Ancestry, and their deceptive practices. It is sad that many will not have checked out what they have agreed to. Thanks again for keeping them honest!!! The article is informative and it is well understood that FTdna and Ancestry are rivals. I personally think they both have positive points. One problem for Ancestry is its church affiliation. Without contractual language that is carefully worded to protect themselves against lawsuits they could not make their research tools available to everyone who wishes to use them. I have been pleased with on phone help every time I needed it. I am not always happy with their practices. FTdna has many features I like and I prefer to have my family test with them. However, I prefer to document my pedigree using the easy access to Ancestry’s records even if they then own my information. I do not like the trees that are not well documented, but that is true with all trees for any testing company. I am not too troubled by the disclaimers. It is no different from the ads we see for various new medications–the ad begins by telling how marvelous the medication is, then that is followed by a list of potential horrible side effects. Companies have to do this to protect themselves from lawsuits for 1 in a million bad results. I suspect the Ancestry.com product is basically fine, but if they want to keep it affordable, they have to prevent frivolous lawsuits. Suggested Relationship is Grandparent/ Grandchild, Half Siblings and the Shared cm is 1853.94 and the longest block is 84.51 wouldn’t they be half sibling and not grandparents. I thought that the grandparents would be farther apart than that. I thought that as you get farther and farther away from a grandparent the Shared cm would decrease. I am so confused with this one. I’m going to write a blog on Family Finder basics. That would be great, because when you have numbers like that and one person say it is a half-sibling and another say a grandparent you do not know who is right or if they are at all. Then you don’t want to say anything to the adoptive person about who their parent is. As you can guess I do not know what to tell that person. I don’t know where she fits in the family. This page at the ISOGG wiki should help you understand inheritance percentages. Is the 84.51 the SNP’s number we use or is it the 1853.94? Sorry, I can’t answer this out of context. Plus, I’m not sure what you’re trying to use it for. Where do I find the number for inheritance percentages? Is it located on my tested family member’s family finder? If the person tested matched another person with Shared cm is 1853.94 and the longest block is 84.51 what is there inheritance percentage? I do not know whereyou are getting the inheritance percentage. I sent the link to inheritance percentages because you were wondering why someone would be classified as either grandfathers, grandmothers, aunts, uncles or half-siblings. It’s because they share 25% of their DNA. Only genealogy work can tell you which of these the person actually is. This is very important information that I have not seen in any of the other blog posts on ancestry’s new test. It will be interesting to see if anyone from ancestry replies here to defend their practices. Maybe they can start with explaining why ‘consent’ is not marked optional. I seriously question the DTC Consumerist values of Ancestry.com as a company. IMHO, they are failing consumers by not releasing data to consumers RIGHT NOW! I see the need for either self regulation right now or let the federal government look at this more. ISOGG does not have the staff or willingness to do this. what would be a good suggestion .for doing DNA testing for finding out ethnicity. I want to get this done as soon as possible but want to do some homework on it first. Since you seem to know what your talking about do you have suggestions then on a good company or perhaps one of your readers? Right now the best value is this. But a kit at http://www.23andme.com for $99. This gets you ethnicity, cousin matches and health info. If you don’t want the health stuff, just ignore it. Then download your raw data file and upload it to Family Tree DNA for $89. From then you’ll get ethnicity and cousin matches too. And this total package costs less than the Family Finder price of $289 at Family Tree DNA, plus you’re fishing in 2 pools so to speak. You can then also take that file and upload it to GedMatch where you can do advanced matching. For anyone who is wondering, as I was, whether AncestryDNA has improved the no-raw-data situation in the 10 months since this post: NOPE. They’ve given me very little that I didn’t already know (the big chunk of Europe, extending into Russia, that is the homebase of my maternal and paternal lines), along with 5000+ possible “4th to 6th cousins” who’ve taken the test with them. Utter waste of money, and a big letdown after taking years to do a test — had been waiting for one that would give substantial results with women or men, so I wouldn’t have to bother my brother for the spit sample 🙂 and after that had waited for a good deal on the price. Now I get to do it over again with 23andme. Thanks to the OP for the advice; I’ve been sharing this post elsewhere for interested parties. You still need your brother’s DNA for the Yline. These different types of tests don’t replace each other, they augment each other. 23andMe does not test the Yline at the personal level so he’ll need to test at Family Tree DNA for that.